Published: Oct. 29, 2012 at 11:40 p.m. Updated: Oct. 30, 2012 at 02:04 a.m.
Let us cease all discussion of an actual race in the NFC West this season. This division is Niners country, made obvious in San Francisco's 24-3 drubbing of the free-falling Arizona Cardinals on Monday night. This was a turkey shoot for the 49ers' defense, which chased around poor John Skelton all night. Alex Smith was the picture of tranquility in comparison, connecting on 18 of his 19 passes for 232 yards and three touchdowns for the 49ers. Smith's only incompletion on the night was on a drop by tight end Delanie Walker. Had Smith completed one more pass, it would have qualified as the most-accurate performance in NFL history. Jim Harbaugh dismissed the notion that Smith needed a game like this to boost his confidence. "I don't think there was ever a question there," the 49ers coach said. "I think it's just a lot of gobble-gobble turkey." Harbaugh was asked to clarify. "Just gobble, gobble, gobble turkey from jive-turkey gobblers, you know?" he said. "I think that paints a pretty good picture. He's a very confident guy." The 49ers (6-2) still have questions to answer. That lopsided home loss to the New York Giants two weeks ago still echoes, and it tells us the NFC still goes through Route 3 and the Meadowlands. But Harbaugh can savor this one, which wasn't nearly as close as the final score might suggest. The crowd at University of Phoenix Stadium was taken out of this game after the first drive. There were no surprises on this night. The Cardinals' offensive line is woeful. Randy Moss scores on Mondays. 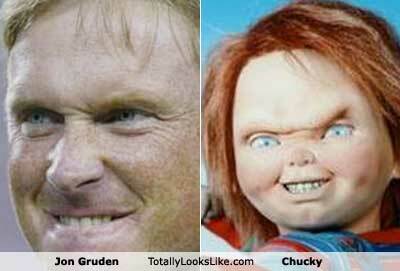 Jon Gruden confirmed he'll be "Chucky" on Halloween for the 14th consecutive year. And the 49ers remain the class of the NFC West.